We are looking forward to hearing from you. Use the contact details below to send us a message and we'll reply as soon as we are able. 1. If you are coming through Te Anau you can't miss us. The Manapouri-Te Anau highway leads directly to the township of Manapouri. We are the first premises on the left, when, after travelling for 20km from Te Anau you reach Manapouri. Look out for our red road sign. 2. 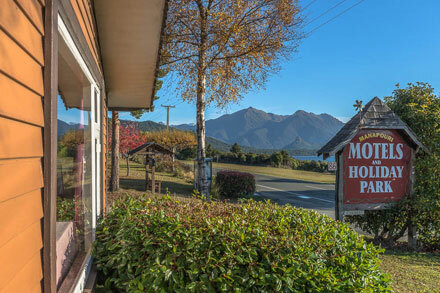 If approaching Manapouri from Hillside road (which you will be if you are not travelling directly from Te Anau) you will enter the Manapouri township and almost immediately find yourself at an intersection facing the lake. A right turn, towards Te Anau, will take you to us. We are the last premises on the edge of the Manapouri township. Stop looking at that beautiful lake on your left! Look out for our red road sign on your right.